Advantages: Excellent range of options; superbly printed; very high quality detailed instructions. 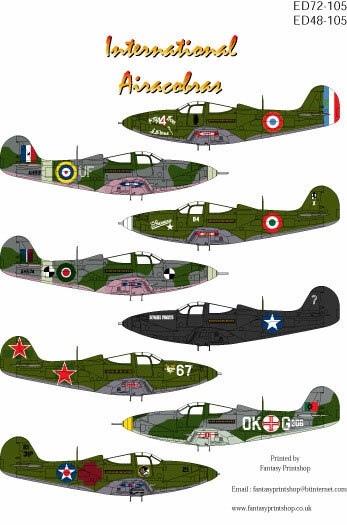 Euro Decals has released a fine quality decal sheet depicting International operators of the P-39 Airacobra. 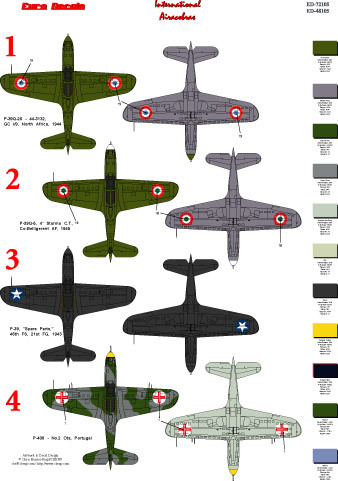 The decals are available in both 1/72 scale (ED72-105) and 1/48 scale (ED48-105). The decals are superbly printed by Fantasy Printshop with good colour saturation and register. The carrier film is ultra thin and my experience with Fantasy Printshop in the past has been that they have to be handled carefully and snuggle down into the surface detail well. The carrier film then almost totally disappears under a coat of clear. The guys at Eurodecals have done an excellent job of the decal artwork and the instruction sheet. 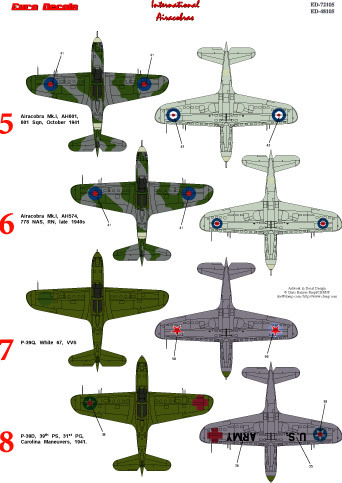 The instructions also give some good detail colours for the subject aircraft. Bell Airacobra Mk.1, AH601 of 601 (City of London) Sqn RAF in October 1941. This aircraft is finished in Dark Green and Ocean Grey upper surfaces and Medium Sea Grey under surfaces. The spinner and fuselage band is finished in Sky. Bell Airacobra Mk.1, AH574 of 778 NAS of the Royal Navy the late 1940s. This aircraft is finished in Dark Green and Ocean Grey upper surfaces and Medium Sea Grey under surfaces. The spinner and fuselage band is finished in Sky. This arcraft has black and white datum reference circles painted on it for carrier trials. Bell P-39Q White 67 of the Soviet Union. This aircraft is finished in Olive Drab upper surfaces and Neutral Grey under surfaces. Bell P-39D of the 39th PS 31st PG based in Carolina in 1941. This aircraft is finished in Olive Drab upper surfaces and Neutral Grey under surfaces and had red crosses painted on the aircraft in temporary paint for training exercises. Bell P-39 “Spare Parts” of the 46th FS 21st FG in 1943. This aircraft is finished in overall black. The aircraft was built entirely from spare parts from salvaged hulks by the mechanics of the 46th FS. The aircraft was possibly used as a night fighter and has no wing guns. One French and one Italian P-39 in Olive Drab and Neutral Grey, plus a Portugese Airacobra round out this colourful collection.